Puroflux Water Filtration Systems: Installation, Parts & Service | RBE Inc.
Filtration systems remove particles from the circulating water. Choosing the right filtration system for your cooling tower is essential to its operation. Highly efficient filtration systems keep your heat transfer surfaces clean and free from corrosion. This means improved energy savings and longer lifespans for your equipment. At RBE, we offer Puroflux’s complete line of separators and permanent media filters in a range of materials and configurations. We also provide installation and maintenance services to ensure your filtration system is working at its maximum performance. Puroflux has a complete line of separator and separator packages that lend themselves to a wide range of applications for removing suspended particulate. Their standard equipment can handle flow ranges from 5 to 20,000 gpm, as well as operating pressures up to 150 psi. The separators are constructed from carbon steel and can be installed in harsh environments. Puroflux also offers custom separator systems which can be designed and fabricated to meet any specific requirements or configurations needed. Along with separators, Puroflux also provides permanent media filters that come in a range of materials and configurations. Their standard filtration products can be applied to a variety of conditions that can help with the removal of suspended particulate. With Puroflux, their custom systems can also be designed and engineered to meet specific requirements such as the use of different filter media to enhance filtration. We believe that Puroflux filtration systems get the best results for our customers. Puroflux continues to lead the filtration system industry with innovative ideas and products year after year. They offer a wide variety of filtration products that can satisfy the majority of applications. 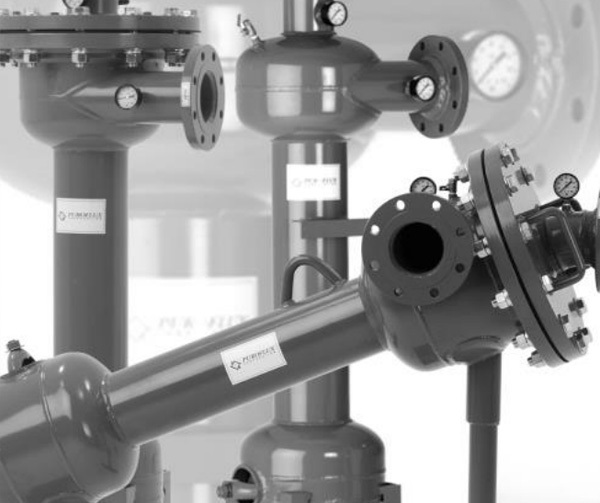 Their systems are specifically designed to handle various pressures and flows and can be engineered to meet specific demands and configurations. Cooling tower filtration systems have a big job to do. Because they are in constant use, regular maintenance is essential and occasional service is necessary. Cooling towers can attract, as well as absorb, airborne contaminants regularly. This debris and other suspended particles that are found in a cooling tower can create numerous issues, such as corrosion, fouling, scale, and more. These problems can then lead to heat transfer efficiencies being severely reduced, making your system work harder. If not treated properly, this could cause more maintenance problems down the road. Sometimes filtration systems can get clogged with debris and grime that can’t be removed through the system with standard filtration. The reduction in flow can reduce the cooling towers ability to cool, and if left untreated, it can produce a surge in energy usage. A certified expert should check the filtration system regularly for any severe clogs or debris that could prevent the system from working at its maximum capacity. Has your cooling tower been using more energy than usual? Then it may be time to get your filtration system serviced. Proper filtration can help your system work at its maximum efficiency. A new filtration system can help remove particles as well as suspended solids, making your system working its best. Whether you need a new filtration system or a simple repair, call our team today at (248) 874-2006.